I hesitated before putting any titles next to Cindy Teevens’ name; it’s hard to assign a title to someone who knows she is both nothing and everything all at once. In the end, I did assign titles for the sake of consistency and to provide a window into what she is. But really, more than an author or speaker or anything else, Cindy comes across as a force of energy that’s at once light and powerful. If after reading this article, you have any inclination to agree with or challenge what she says, I recommend taking a closer look. At best, you’ll be enlightened and live in a state of peaceful joy. At worst, I can’t imagine you won’t at least learn a thing or two about releasing negative thoughts and feelings, and having greater empathy and compassion. Coming into the interview with Cindy, my plan was to first cover the basics (background, education, etc.) so we could spend the rest of our time delving into deeper matters—existence; the universe; how her book Alchemy: How to Feel Good No Matter What can release people from the burdens of thought and assumption, and lead them to a life of love and joy. But we kept straying from the minutia of her résumé, which fits quite nicely because Cindy, like the rest of us, isn’t defined by her bio. She just is. Cindy was born in Germany (her biological father, who worked for the Royal Canadian Air Force, had been posted there) but moved to Ottawa, Ontario at age one and has lived there most of her life. She has three sisters and two brothers, and was raised by her mother and stepfather. So she did. She graduated from Cairine Wilson Secondary School in 1983, and from New Liskeard College of Agricultural Technology in 1986 with a diploma in Equine Technology (and several communications courses to boot). She launched a horse magazine—first called The Horse Source, then Nuzzle—and served as publisher and editor-in-chief. But the questions hadn’t gone away. When Cindy closed the magazine business after 11 years, she experienced a loss of identity, having tied herself for so long to titles such as “publisher” and “writer.” She realized that the labels most of use to identify ourselves are not what really matter, and started looking more deeply into why we feel the need to define ourselves at all. By late 2002, the questions got so powerful that Cindy began actively searching for answers. She investigated and considered a wide variety of religions and teachings, but none satisfied, and her craving for truth without “the social trappings of religions” only grew stronger. In the end, she settled on studying Zen. But only a few months into the practice, something happened that intensified her quest and ultimately led her to understand that, rather than needing to find the answers, there is no need for the questions at all. In March 2003, Cindy’s stepfather—known to her as “Dad”—attempted suicide. He shot himself in the head and chest, and she discovered his unconscious body. The doctors determined that there was too much brain damage for her father to regain consciousness, so the family removed life support and he passed away one week after the shooting, with Cindy by his side. 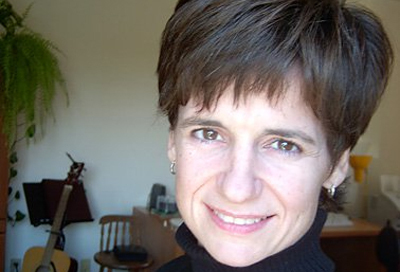 That experience resulted in three months of intense grief for Cindy, but it also prompted her to vow, as she left the hospital after her father’s death, “that it would not be for nothing.” She committed herself to exploring the answers to her questions and finding a way to “control her state no matter what” (or so she described it at the time). Ultimately, she realized she was searching for the wrong thing. She didn’t really want to be able to control her state no matter what; she wanted to be free from letting the outside world affect her state, no matter what. That is, to be happy and at peace regardless of what others did or didn’t do. That realization—which she readily acknowledges has been explored by “all great spiritual teachers past and present,” including Rumi, J. Krishnamurti and Eckhart Tolle—led to a series of revelations. 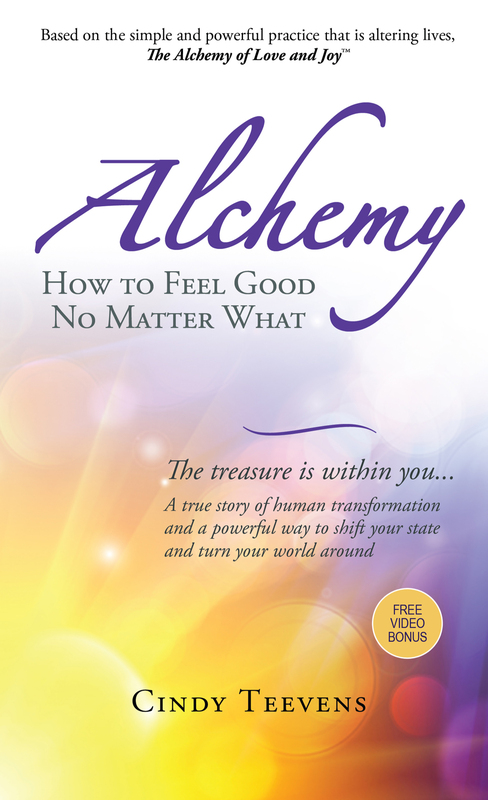 Ecstatic, Cindy wrote many of them up in the book that went on to become Alchemy: How to Feel Good No Matter What. Joy and peace became the norm for her, and when other feelings threatened to replace her contentment, she learned to shift her focus away from the thought that caused the “negative” feeling and toward what she truly wanted. “When you shift your state, your whole perspective and world shifts,” she says. “Problems dissolve, villains become victims and compassion kicks in.” She dropped everything else and devoted her time to sharing her realization with others. But part of the reason that quote is important to me is because I still need to be reminded of it; I tend toward questioning and analysis, even though I know it’s often best to just “be.” So I came to my interview with Cindy prepared with a slew of challenges and queries into her book and philosophies. I wasn’t trying to be difficult; I simply wanted to understand her practice better and be able to articulate it clearly in this article. In Cindy’s case, her attention went toward the Divine (or God, or the Source, or whatever name you choose to ascribe). Prior to her walk in the woods, she’d been asking the question, “If the Divine is everywhere, why isn’t it obvious?” In fact, it was the question itself that had prevented her from seeing. When she was finally struck by the realization that the Divine truly is everywhere, and even as her, it suddenly became obvious; it always had been. The beauty of Cindy’s practice—in addition to the fact that it can set you free of feelings such as jealousy, resentment, fear, anger—is that it focuses on our potential to mend the hurt around us, as well as within us. Because if you know, as Cindy came to realize in the woods, that there is no separation between people and things, you and the universe, and if you truly listen to your inner voice (i.e. if you aren’t clouded by false feelings that could lead you to exploit or damage others), you will only do good in this world. There’s much more I could write about my talk with Cindy, and the instances she cited in modern scientific developments (for example, entanglement theory) that illustrate both what she knows to be true (that there is no separation) and that we’ve been conditioned to disbelieve it (scientists assume that two things have become entangled; whereas, in her words, “they’re not entangled; they’re not separate.”). But for those of you who are fascinated by her teachings, there are many ways in which you can explore them further (outlined below). So I’ll sum up by returning to some of the facts about Cindy. She came to my attention when she sent a very sweet email congratulating me on this website and encouraging me to continue. I chose her as a Kickass Canadian not only because of the work she’s committed to, but also because, when Alchemy: How to Feel Good No Matter What was chosen out of 3,000 books and won her the 2010 Next Top Spiritual Author Contest, she turned down the publishing deal and instead began distributing her book for free online. “What matters to me is that my book draws the right people and it helps the right people,” she says. Her book is still available for free in PDF via Cindy’s Facebook page, and you can also purchase the hardcopy by emailing cindy@alchemylovejoy.com. The book officially launches in hardcopy in 2012, when you can find it through all the usual channels, including bookstores and Amazon. Cindy also offers talks, workshops and individual consultations on her practice The Alchemy of Love and Joy™, all of which are outlined on her website and aim to help people realize that they can shift their state to control their feeling. On top of Alchemy, she runs the publishing company Go Beyond and is working on a new work of creative non-fiction. The questions may not be the ultimate goal, but they are what led her to her current practice of Alchemy. And they represent awareness, even if only at a subconscious level, that we are not wholly at peace with who we are and how we see the universe. With that, Cindy and I hung up the phone. Except it didn’t feel like an ending; it felt like the conversation was only just beginning. For more on Cindy, email cindy@alchemylovejoy.com, visit alchemylovejoy.com, ‘Like’ her Facebook page or follow @CindyTeevens on Twitter. Some intriguing and inspiring thoughts here Amanda; thank you as always! Some very powerful points here. Will read it again for it to sink in. Thank you 🙂 Great job! These truths are so profound, yet so simple. They really have the power to change the world. Thank you for writing this Amanda – and for introducing me (us) to Cindy. What an amazing woman. P.S. Cindy studied in my hometown of New Liskeard! Ha! I thought this article would resonate with you, Vicki. Thanks for checking it out! Glad you enjoyed it. I know Cindy and have known her for several years. She definitely walks the talk and is a great example of the happiness and peace that we all want. Thanks for putting her name out to an even wider audience. Take care, stay well, have fun! Hi Stephen, thanks for the comment! It’s my pleasure – wonderful to have such a positive force as Cindy out there.